Background: Pain management through epidural catheters has emerged as optimal method of pain control in patients with rib fractures. This study was done to evaluate the efficacy of butorphanol in this subset of patients. Materials and Methods: Sixty patients were randomly allocated in two Groups R and B. Group R patients received 0.2% ropivacaine epidurally (10 mL) while Group B patients who received 0.2% ropivacaine and 1 mg butorphanol epidurally (10 mL). Baseline respiratory rate, oxygen saturation, partial pressure of oxygen, visual analog score (VAS), and peak inspiratory flow rate were noted in both the groups. Results: There was a significant increase in duration of analgesia and nonsignificant reduction in VAS score in Group B and nonsignificant decrease in invasive ventilation cases and significant reduction in length of Intensive Care Unit (ICU) stay in Group B. There were no significant adverse effects in both the groups except for nausea in Group B. Conclusion: Butorphanol as an adjuvant to epidural analgesia leads to better oxygenation, decreased length of ICU stay, and duration of mechanical ventilation without increase in significant side effects. 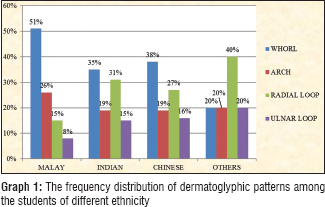 Background: Dermatoglyphics is developing its importance in everyday life and researchers are keen to unveil various unknown aspects of dermatoglyphics in biology, anthropology, genetics, and medicine. The present study was conducted to assess the relationship of thumbprint, learning methodologies, and academic performance of medical students. Methodology: A total of 143 medical students voluntarily participated in this study. Ethical committee clearance was obtained before the study. Validated questionnaires were distributed to the students, and their right-handed thumbprints were collected simultaneously. The data were analyzed using Microsoft Excel. Results: The most common dermatoglyphic pattern observed among the students was whorls. Malays, Malaysian Indians, and Chinese mostly had whorl pattern, while among the Sri Lankans the most common pattern was radial loop. A high percentage of students with ulnar loop scored distinction while students with other patterns mostly scored pass marks. Active learning strategies such as bringing reference books to class, revising previous chapters before class, taking notes in class, surfing internet for learning was seen mostly among the students with ulnar loop. Conclusion: Most of the students with whorl pattern were either in low or average scoring groups. Individuals with ulnar loop were significant for this study as they had higher scores and better learning methodologies compared to other students. Introduction: Femur length (FL) is a fetal biometric parameter used for estimation of gestational age. Gestational age determination by ultrasonography (USG) is very essential as it gives an accurate estimation. Aim and Objectives: This study is an attempt to measure FL of the fetus for the prediction of gestational age in the IInd and IIIrd trimester of pregnancy by USG. Materials and Methods: Five hundred pregnant women in the IInd and IIIrd trimester with the single live fetus and having no other complications either in mother or fetus, were selected for the study. Fetal FL was measured, and results were analyzed for accuracy in estimation of gestational age and were compared with findings of other workers. Observation and Results: Gestational age estimated from FL in 500 cases between 20 and 36 weeks of gestation showed that in the mean FL in each week of gestation the maximum difference of ±0.7 mm was found in the IInd trimester and ±2 mm was in the IIIrd trimester. The accuracy of the correctly diagnosed cases and P value decreases as pregnancy advance. 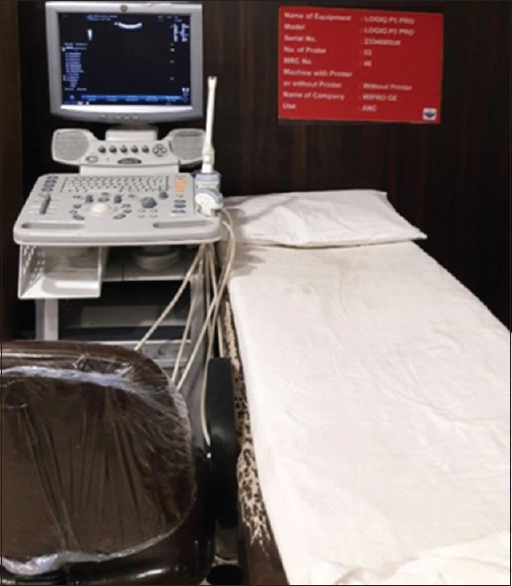 Conclusion: Sonographic examination was found to be effective to assess the accurate FL parameter for different weeks of gestation. FL was found to be more appropriate in predicting gestational age in the IInd trimester and its reliability decreases in the IIIrd trimester. Introduction: Head injury in pediatrics is considered to be a major health problem that is a frequent cause of death and disability and makes considerable demands on health services. In developing countries accident rates in general and traumatic brain injury (TBI) in particular are increasing as traffic increases besides other factors such as industrialization, falls, and ballistic trauma. Aim: The aim is to study the clinical profile of children with head injury. Objectives: (I) Study the etiology of head injury in children >16 years admitted in our hospital. (II) Study the clinical course and management of patients during the hospital stay. 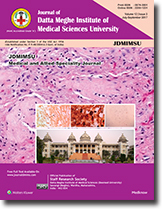 Materials and Methods: Place of Study: AcharyaVinobaBhave Rural hospital, Sawangi, Wardha. Study Design: Prospective observational study. Study Duration: July 1, 2015–June 31, 2016. Sample Size: Fifty. 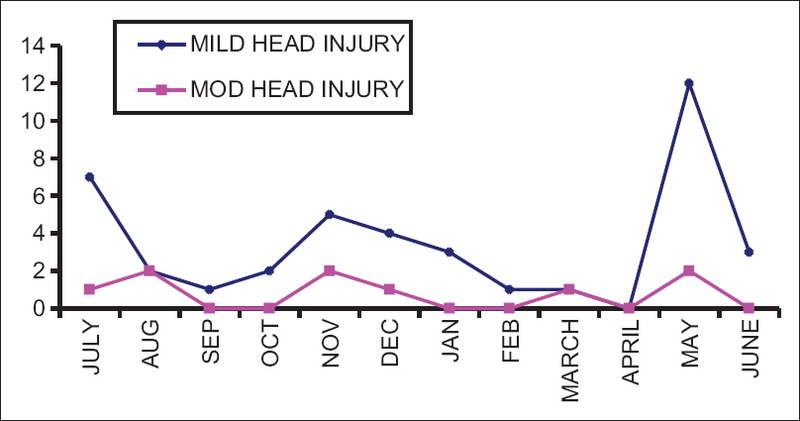 Result: As per my survey, fall from height as the most common cause of pediatric head injury with male predominance, followed by road accidents various other. The most common lesion seen on computed tomography scan was an extradural hematoma, and frontal lobe being the most common site. 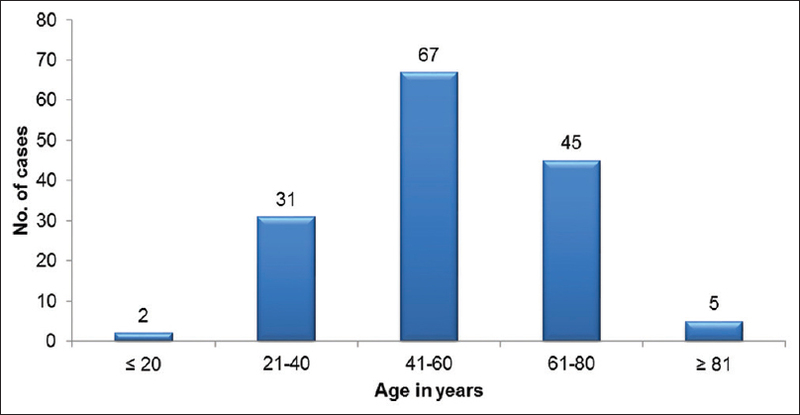 Conclusion: TBI in rural areas is mostly among the young male population and is increasing every year with majority coming from nearby villages which is very alarming and highlights the need for taking urgent steps for establishing good prehospital care and provision of trauma services at site in India. Background and Objectives: Dysphagia refers either to the difficulty someone may have with the initial phases of a swallow (usually described as “oropharyngeal dysphagia”) or to the sensation that foods and or liquids are somehow being obstructed in their passage from the mouth to the stomach (usually described as “esophageal dysphagia”). Upper gastrointestinal GI endoscopy is an important tool in the initial investigation of dysphagia. Endoscopy is indicated in patients with dysphagia to determine the underlying etiology, exclude malignant and premalignant conditions, assess the need for therapy, and perform therapy, such as dilation. Endoscopy-guided biopsy is indicated in structural causes observed during the endoscopic evaluation for confirming the diagnosis with histopathological correlation. Material and Methods: A study of 150 patients who presented with dysphagia, and the study focuses the importance of endoscopic (biopsy when needed) evaluation in these patients. Results: Study shows that the sensitivity of endoscopy was 1.000 (95% confidence interval [CI]: 0.942–1.000), specificity was 0.875 (95% CI: 0.787–0.936). The PPV was 0.849 (95% CI: 0.746–0.922). The NPV was 1.000 (95% CI: 0.953–1.000). Conclusion: Upper GI endoscopy is a safe and effective way to evaluate dysphagia and has both diagnostic and therapeutic value. Background: As India strives to achieve universal health coverage, improvement in oral health-care delivery through availability of skilled and motivated dental professional is essential. To provide effective oral care, understanding of the current oral hygiene practices and the existing scenario of oral care services is a must so that oral care can be customized for every geographical region keeping in mind the prevalent cultural trends. Aim: This study aimed to determine the oral hygiene practices of a section of rural population in India with the secondary objective to report barriers for utilizing oral health care. 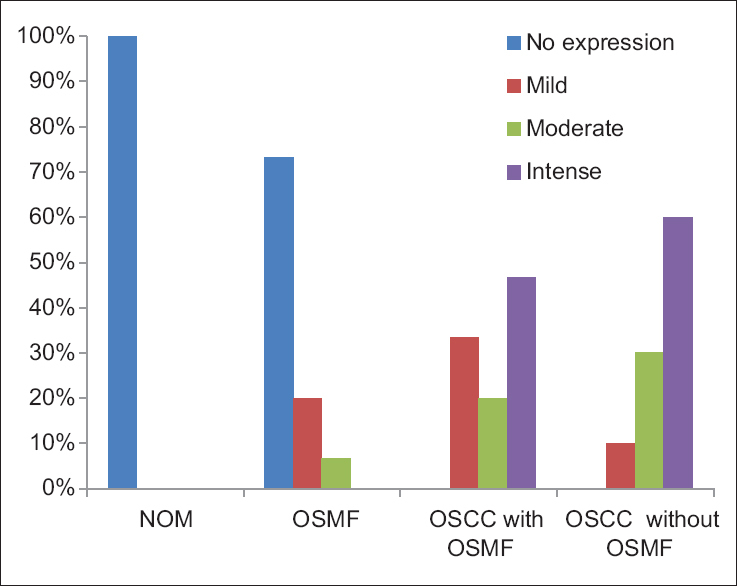 Material and Methods: A cross-sectional questionnaire study was conducted among 384 patients who reported to dental unit of Lifeline Express for treatment. Responses were obtained on a 5-item questionnaire consisting of items relating to their oral hygiene practices and consumption of tobacco and alcohol. History of dental pain in the preceding 12 months and reported barriers in utilizing oral health services were also elicited. The data were analyzed for descriptive statistics. Results: Only 52% cleaned their teeth using toothbrush and toothpaste. About 30% preferred traditional chewing sticks and 10% do not clean their teeth. About 36% reported consumption of tobacco and 85% experienced dental pain. Sixty-one percentage of patients did not visit dentist. Lack of knowledge, unavailability of dentist, and “no pain after the first visit” were the main reasons for not utilizing/further utilizing dental care. Conclusion: Our findings suggest encouraging traditional oral hygiene aid among rural population. There is a need to educate rural population which can help them overcome the reported barriers and utilize oral health services to the fullest. Background: Maternal factors could help determine the potential incidence of hyperbilirubinemia. This study was performed with the purpose of establishing the role of the various maternal factors previously indicated as being responsible for exaggerated physiological hyperbilirubinemia in term neonates with serum bilirubin level of 12 mg/dL or more. Materials and Methodology: It was a prospective, cross-sectional study conducted from July 2012 to August 2014 in Pimpri, Pune. A total of 2000 healthy term deliveries were screened, out of which 100 neonates with exaggerated hyperbilirubinemia were included. Data were collected with maternal information. The data were analyzed using t-test (for parametric distributions). Results: During the period of study, 330 babies out of 2000 deliveries had achieved the serum bilirubin level of >12 mg/dL. Thus, the prevalence of exaggerated neonatal hyperbilirubinemia in the current study was 16.5%. There is strong association between maternal infection and serum bilirubin even when only 5 mothers had infection (Z = 2.31 and P < 0.05), whereas no correlation was found with maternal diabetes mellitus, toxemia, and oxytocin infusion. Conclusions: Maternal infection was found to have a significant effect on neonatal exaggerated hyperbilirubinemia. Therefore, interventions should be prioritized to prevent maternal sepsis. The first approach targets facility-based deliveries and requires increased provision and uptake of proper antenatal care early in pregnancy. Electroconvulsive therapy (ECT) is a standard practice for psychiatric patients with suicidal behavior. Modified ECT with general anesthesia has evolved over inducing ECT without an anesthetic. The objective of anesthesia is to provide a rapid onset and offset of both unconsciousness and muscle relaxation for the duration of the electrical stimulus and subsequent seizure. Succinylcholine (0.5 mg/kg), due to its short period neuromuscular-blocking agent, is used to reduce muscular convulsion and decrease the risk of serious injury. Organophosphorus poisoning is an important cause for prolonged apnea following succinylcholine. We report a case of prolonged apnea after administration of succinylcholine for the ECT in a patient with a history of organophosphorus poisoning. A case of a 43-year-old male patient, residing at Nalavade, Wardha, previously hospitalized at Sevagram for organophosphorus poisoning which he had taken 11 days before. He was admitted and planned for intermittent modified ECT treatment. The patient was diagnosed with the major depressive disorder, and he was on medication for the same olanzapine. ECT was given. After the procedure, the patient was ventilated for 45 min. Since the patient did not regain spontaneous respiration, he underwent orotracheal intubation. The patient was then shifted to neuro-Intensive Care Unit for 4 h, and after the restoration of respiration depth and rate, and a normal arterial blood gas, the patient was extubated. The case of depression with suicidal tendencies was given modified ECT using low-dose suxamethonium. Apnea following suxamethonium was prolonged due to the recent intake of organophosphate poisoning. It is imperative to take detailed history including drug history to avoid such recurrences. It is mandatory in all cases with a recent history of organophosphate poisoning to estimate the plasma cholinesterase level before any anesthetic procedure. Enchondroma is a benign chondroid tumor which consists of mature hyaline cartilage and is common in the hands or feet (phalanges, metacarpals, and metatarsals). 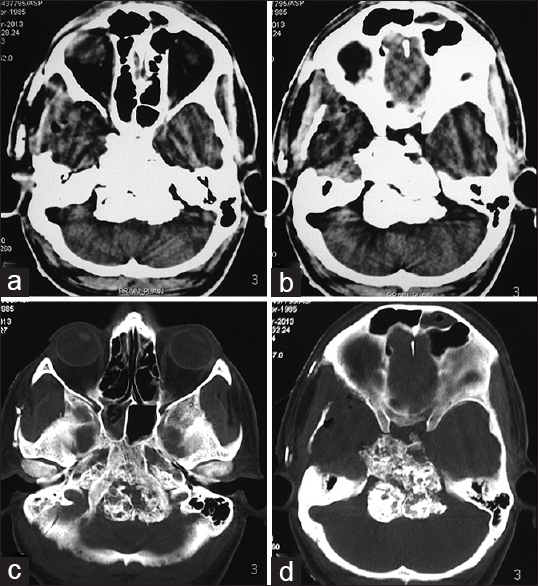 Enchondromas arising from the skull base are uncommon with only few reported cases in literature. 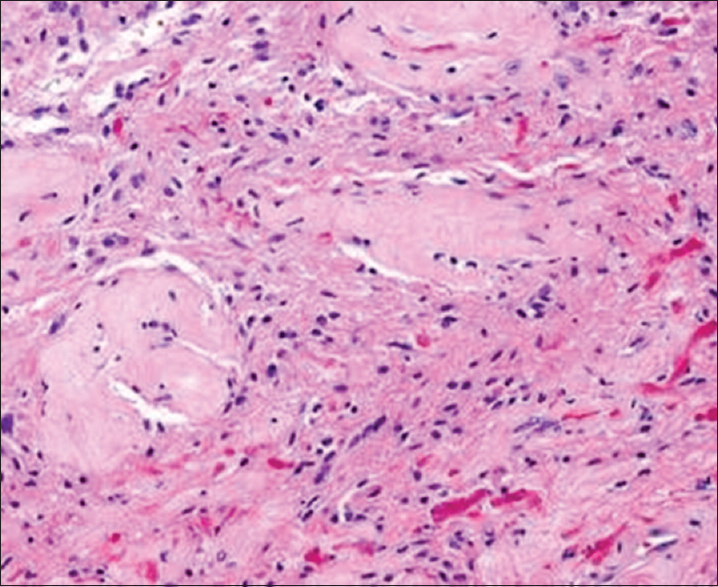 We present the case of enchondroma arising from the clivus and discuss the clinical presentation and potential management options for this entity.